This exclusive 5-bedroom terrace villa has been recently refurbished to very high standard, the executive double en-suite bedroom room (4m x 4m ) is offered to single occupant at the advertised price or to couple for £950 per month. The room is situated on the top floor of the property and is fully furnitured with; a double bed, side bed table, double wardrobe, desk and chair. 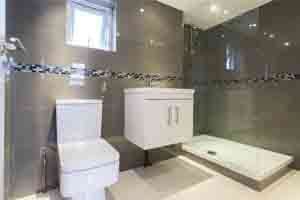 The en-suite shower room is fitted with a very large glass screen and comfortable shower tray. toilet and vanity sink. The neighbouring area of Stratford with the very well renowned Westfield shopping centre can be reached in 20 minutes by bus. Upton park station, only 5 minutes walking distance, offer District and Hammersmith & City line regular service to Canary Wharf (25 min), City Airport (20 min), Oxford circus (30 min). 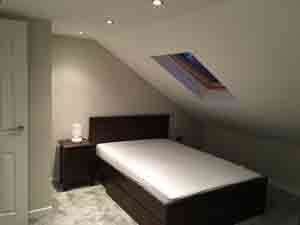 You will have share use of the massive well equipped kitchen, dining (15m X 3.5m). and a decked patio area leading to the rear garden. A variety of Shops, Cafes, Supermarkets, Retail Park Shopping Centre and Leisure Centre with gym & swimming pool are all located within a short distance. The rent is inclusive of bills. council tax and WiFi link to internet.